This variety is variegated giving the leaves a striped appearance. A favorite with seafood in the Bahamas and along the eastern coast. Peppers are striped green and yellow and turn into hot red peppers. 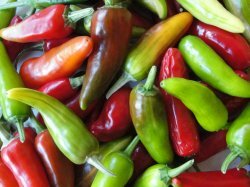 Plants are very prolific producing well over 50-100 peppers. Even though this is an ornamental the peppers are super tasty and great for cooking with!